This episode of Games to Gains begins at the BPI Sports 1.M.R™ launch event at The Gym on Fort Lauderdale Beach. 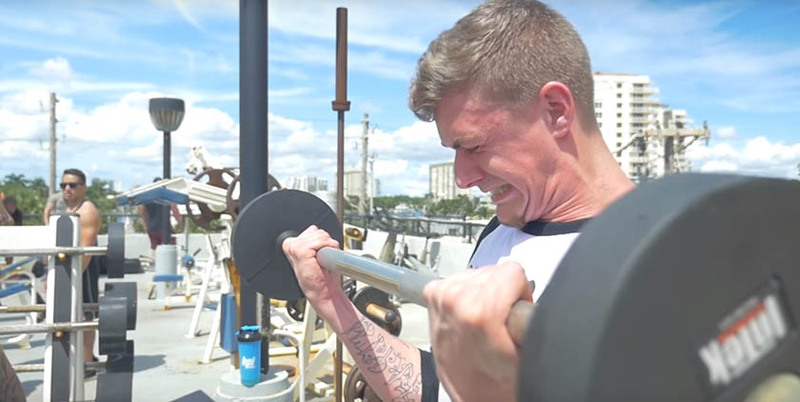 James Grage brings Kerby along to get a biceps and triceps workout in. Then they hit the Ocean Blvd. strip to find something to eat. James: Kerby, did you eat two chicken breasts? Kerby: You know, I’ve never eaten two chicken breasts together at the same time. After I finished the first one, I was feeling full, but at the office they told me that if I ever feel full, I just have to keep eating. James: So that’s a first? Kerby: That’s a first. That’s a lot of food! James: It’s a big step. That’s a big mile marker for Kerby. James: So Mike, I hear you’re working out with us today. Mike: We’re doing legs today, right? Mike: Nice, I’m in there. James: So are you in it to win it? Mike: Definitely in it to win it. Kerby inspired me, man. James: Does this mean you’re making a commitment to the camera, right here, right now? Are you feeling the pressure? Mike: I am! Now I gotta get out there and kill it bro, cuz I can’t have Kerby out there outworking my legs. Look at his skinny legs and look at mine! I gotta do something out there. Will Mike be able to keep up with James and Kerby? Watch the full episode above to find out.